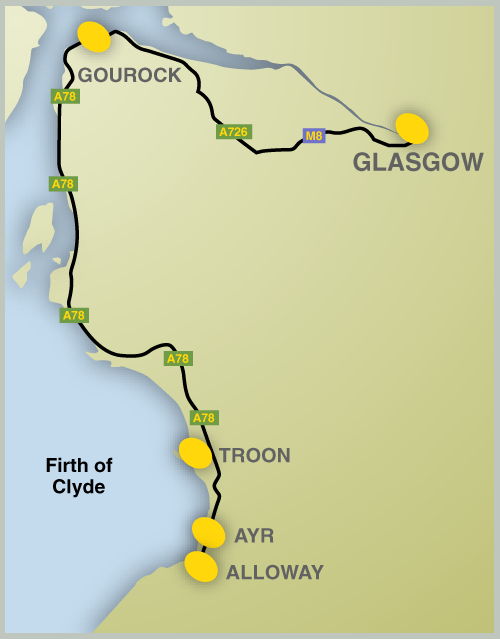 This taxi tour is a full day excursion showing clients the best of Ayrshire and visiting the sights of Burns country. You’ll visit the seaside towns of Gourock, Largs, Troon and Ayr, before going on to Alloway and the Robert Burns Birthplace Museum. This tour is a wonderful way to see this spectacular and scenic area, taking in a number of sites with a stop for coffee or lunch at a choice of venues. Famous for its six quality golf courses – three of them excellent public courses – and a host for the Open Championship, which last visited in 2004. Troon also has wonderful, soft, sandy beaches looking across to the isle of Arran. Opened in 2011, this modern visitor centre showcases Burns’ work and life, with a selection of relics, manuscripts and personal items. It also uses technology to give an interactive element to the experience and broaden the appeal of the museum to youngsters. As far back as 1494 it is recorded that James IV sailed from Gourock to quell rebellious Highland clans. Gourock grew from a small fishing village into a community involved in herring curing, copper mining, rope-making, quarrying and, latterly, yacht-building and repairing. 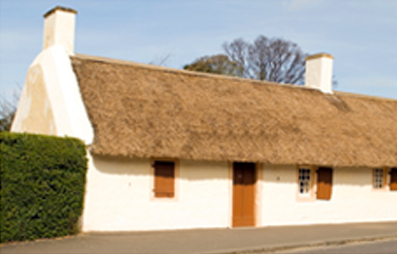 The birthplace of Robert Burns, built in 1757 by the poet’s father. It was been restored to appear as it would have done in the 1700s. Ayr is the largest of the Clyde Coast holiday towns, looking out across the Firth of Clyde to the Mull of Kintyre and the mountains of Arran. Ayr is a historic town with many notable landmarks and is a famed tourist destination as the centre of Burns Country. These landmarks, which feature so prominently in the famous ‘Tam o’ Shanter’, are an essential part of any visit. The Auld Kirk looks much as it would have done in Burns’ day. Robert Burns (1759-1796) is Scotland’s National Bard and in 2009 was voted by the public as the Greatest Ever Scot. A cultural icon of Scotland, his poems and songs are famous across the world, including ‘My Love is Like a Red, Red Rose’, ‘A Man’s A Man for A’ That’, ‘To a Mouse’, ‘Tam o’ Shanter’, and ‘Ae Fond Kiss’. Your route follows a beautiful coastline, with views out across the Firth of Clyde including the Cumbrae Islands and the rugged isle of Arran. The entire Burns Tour costs £220 from Glasgow City Centre (£240 from Ocean Terminal, Greenock) and will last about 6 hours. Partial tours can be arranged on request, at a cost of £50 per hour, with a minimum 3-hour hire. Costs are per five-seater taxi (six-seater available on request).